Camera in smartphones are just getting better day-by-day, gone are the days when we used to need a heavy camera to take pictures and videos. Smartphone cameras are the best to take pictures for both non-professional and professional people. With late Steve Jobs’ legacy to keep everything premium in their products, the iPhone is no doubt one of the best camera phones in the current market regardless of the DSLR cameras, which are quite bulky to carry every time. With the new iteration on iPhone, Apple did a complete overhaul with the camera and its features. They have added powerful lenses, used enhanced hardware for quick and clearer pictures and videos. Even panorama feature is added to the iPhone 5. For people new to the iPhone or want to use its camera to the full extent, here are the best tips to learn all about the art of iPhoneography. Now belief is very important and treating the iPhone like DSLR is very important. Don’t hold the ‘camera’ with one single hand but with two hands and the right hand one the physical shutter button, like we do it on an actual camera. The best part is the viewfinder is quite big than on camera. With holding the iPhone like a true enthusiast photographer, the image quality and stability would be just perfect. Even though the phone has zoom in and zoom out feature, remember its lens is not enough powerful to take crisp image with zoom in mode. As a result, a pixel-distorted or grainy image will be delivered. The best way to take a close up shot is walk up to the subject, get aptly close and capture. Avoid the zoom feature as much as possible. The best part of digital photography is rectifying mistakes. With the latest high-end chips, taking few shots at once is quite possible. Just click multiple images of the same subject and choose the best one out of that. So, if you are out somewhere and shooting with the iPhone, click few shots and in free time choose the best and delete the rest. Just too easy! Light and camera phones go hand in hand. It is important to study light in order to get desired image. Always remember that the lower the light, the more pixelated and bad shot will be obtained. But while taking shots in sunny area let the light fall on the subject whilst behind the photographer. Firstly, check the resolution of the image and set to the highest-level if its not. Don’t shake while taking a shot, as it will make the image blurry. Lean on the hand/camera/arm or take a help of iPhone camera stand to keep it still. Even after you click be still for few seconds, just in case the phone has shutter lag. When you take HDR images waiting for few more seconds after the click is very important. iPhone being a easy to carry device has its own advantages while doing iPhoneography. Try out different angles of and shoot from different positions. Moving in with bundle of angels will give to many images to choose from. The best part of this trick is – it doesn’t cost a single penny. Many people don’t do this but many time but dust and smudges affect the image quality. Clean the iPhone camera lens with clean and soft cloth. Don’t use any kind of abrasives. Last but not the least is keeping the considerable free space so that the phone doesn’t lag during taking the shot, affecting the image quality. Use headphone’s volume up button as a shutter release if you are using your iPhone on iOS 5 or later (iOS is iPhone’s operating system). 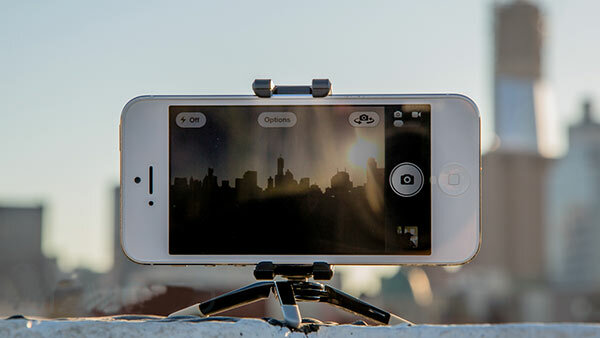 This makes you free from the hassle of tapping on the screen while taking the shot. Use tripod if you use the headphones very often. The result will be crisp clear image. Get camera apps from the iOS App Store, they make iPhoneography more simplified. That’s it you are ready to handle the tiny but powerful camera. Take the iPhone out of your pocket and capture the beauty of this world around you.